This provides you with two sockets, a socket for your DSL cable (at the top) and a socket for your telephone (at the bottom). Your broadband signal is fully filtered at source, so there is no need to use microfilters whilst using your FTTC service. 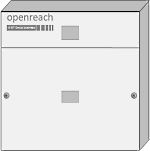 The Openreach engineer will also setup a white box called the Active NTE. This is a VDSL modem that allows us and Openreach to perform advanced diagnostics on your line if you experience a fault. There is no setup to be performed on this piece of hardware, however you should ensure that it remains plugged in to the top DSL port at all times. 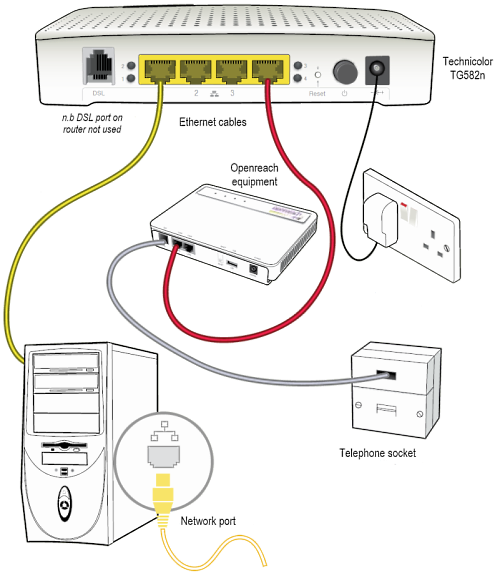 The Openreach engineer will also leave a Data Extension Kit, which allows you to move the Active NTE up to 30 metres away from your main telephone socket. If you do use this, please remember to plug it in to the top socket. The other end of the cable will go into the port marked DSL on the rear of the Active NTE. 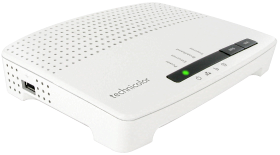 As part of your FTTC service, we will send you a Technicolor TG582n router. 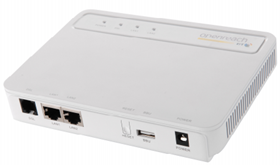 This will arrive pre-configured, so all you need to do is connect it correctly to the Openreach Active NTE and turn it on. After around five minutes your broadband service will be ready to use. Connecting your Technicolor TG582n router is a simple process. Inside the box will be a yellow Ethernet cable. Simply plug one end of this into port four on the back of the router. When you look at the rear of the router it will be on the far right hand side of the row of yellow sockets. Plug the other end of the Ethernet cable to the port marked LAN1 on the rear of the Openreach Active NTE. Finally, ensure that the DSL cable from the rear of the Active NTE is plugged in to the top socket of your main telephone socket. Plug your Technicolor TG582n router in and press the black On switch on the rear of the unit. After around five minutes your FTTC connection will be ready to use - you should see a green Broadband and a green Internet light on the front of your router. You can plug your own equipment into the other three available ports on the rear of the router. Depending on your operating system, please use the following steps below to configure your wireless network. If for any reason you need to configure your Technicolor TG582n manually, you can use the instructions below. Firstly, log in to the web interface of the router. If you are unsure how to do this, please see this article. You will be presented with the following page. To access the settings first click on Advanced options near the bottom of the page. Using this profile all of the Ethernet ports on the router will hand out internal (NAT) IP addresses. First of all click on Technicolor Gateway on the left. Next click set up my technicolor gateway. You will be presented with a pop-up window. If you cannot see the window check that your browser is not blocking pop-ups. Set this up as in the image below and be sure to enter your own radius username and password. When you are ready to proceed click Next. You will be asked to confirm so choose Yes when prompted. If everything was entered correctly you should see the following message confirming that the setup has been successful. Using this profile all of the Ethernet ports on the router will hand out public IP addresses. You will need to know your IP allocation, which can be found in your welcome email or in your DSL control panel. This is assuming that you have already completed the ADSL (Standard) setup instructions above. If you have not already done this please go back and follow the setup instructions before proceeding. When you have completed the steps above click next, or skip if you have previously completed the NAT setup. Enable the Public Subnet checkbox and you will be presented with the settings below. Enter your own router IP and subnet mask. The Subnet ID, broadcast address and LAN IP range will be entered automatically. Be sure to select In Range (WAN IP is in your Public range) and NAT Disabled. Click Apply and if everything is correct you should see the following confirmation.